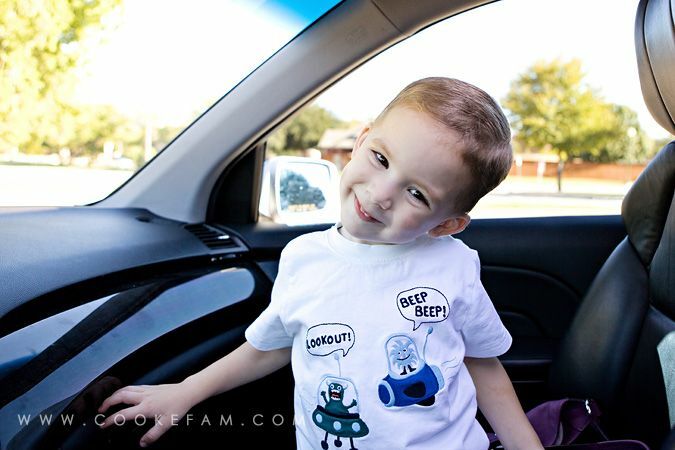 First of all, now that Ethan has started Kindergarten, we get in the car at least twice a day. That is significant because, before this school year, there were definitely days that we did not go anywhere. And I would do that on purpose. But now that car trips to and from school are inevitable 5 days a week, Ethan has come up with games to play on our way. We have always played I Spy and variations of that game, but now Ethan has come up with "Guess the Country" or "Guess the State" or even "Guess the Animal" games. He makes up the rules and we all take turns giving clues. Honestly, I really love this. And it is so much like Ethan to do this. Side note: that face - even with just half a smile - makes me melt. The most memorable thing about Logan in the car for me is his carsickness. 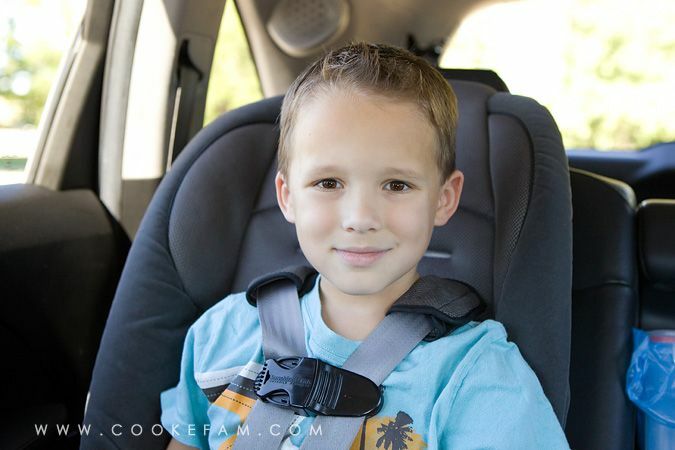 Starting when he was about 16 months old and we turned his car seat around (I know you're supposed to wait longer these days), he would occasionally vomit in the car. 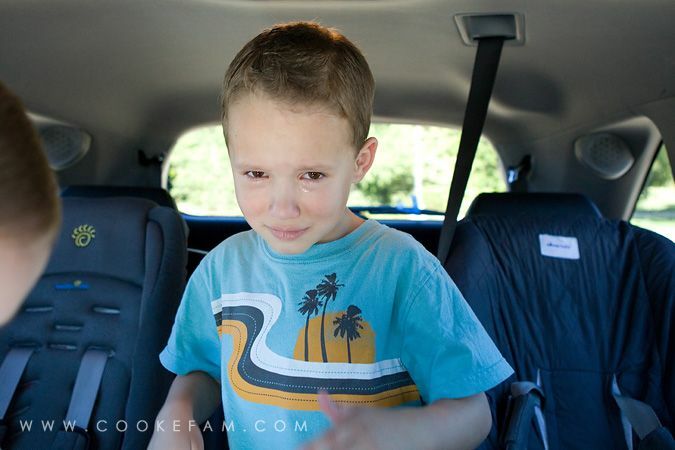 At first I thought it might be a stomach bug, but then I picked up on the pattern...he would always do it in the car and it was usually when he was holding a toy or book, which meant he was looking down at something. When I figured out what it was, I took all of the toys and books out of the car (which was a bummer for Ethan) and we have a strict policy about it because he still gets sick under those circumstances. Poor kid. 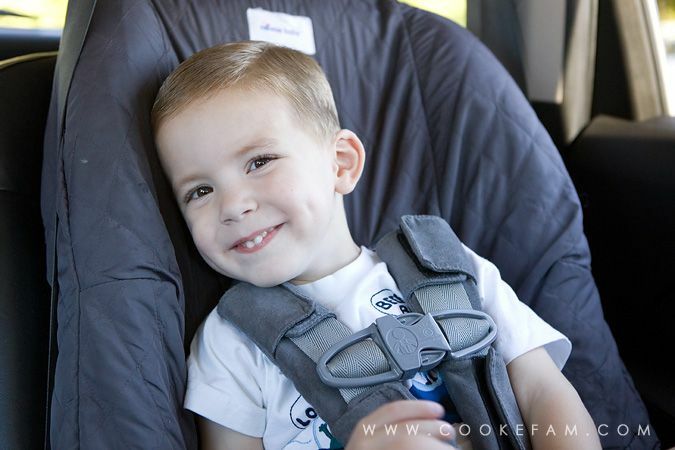 And you'll notice the car seat cover in the photo below. 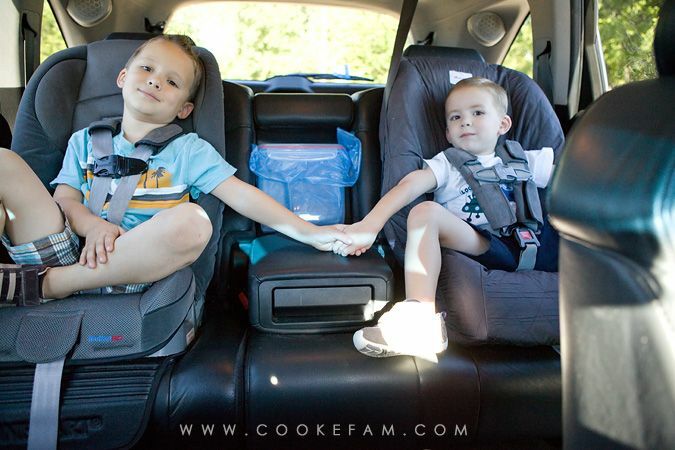 That was the second thing I did...searched high and low for a waterproof cover that would fit our super-tall car seats and could be removed without completely disassembling the whole car seat. Because parents know that whole process is something like the 9th ring of hell. 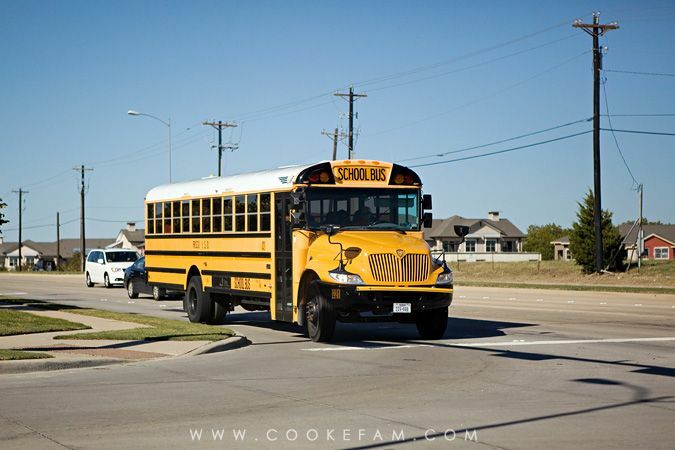 I did it so many times before we figured out this whole carsickness thing that I got pretty fast at it, but I still have nightmares about the task. I love that we can avoid that yuckiness for the most part now. I much prefer to see his toothy and dimply smile. I cannot mention car trips without mentioning the thing that drives me absolutely nuts...the boys dropping something and asking me to get it. I don't know what's worse...listening to them beg for it with increasingly loud and shrill pleas, or having to contort into all sorts of positions to retrieve it to restore the peace. Or actually...it may be trying to explain that I am driving and can't get your pencil, stuffed animal, cracker, water, toy car, shoe, etc....right this second. The concept that driving is an activity that requires attention is completely beyond their comprehension, apparently. 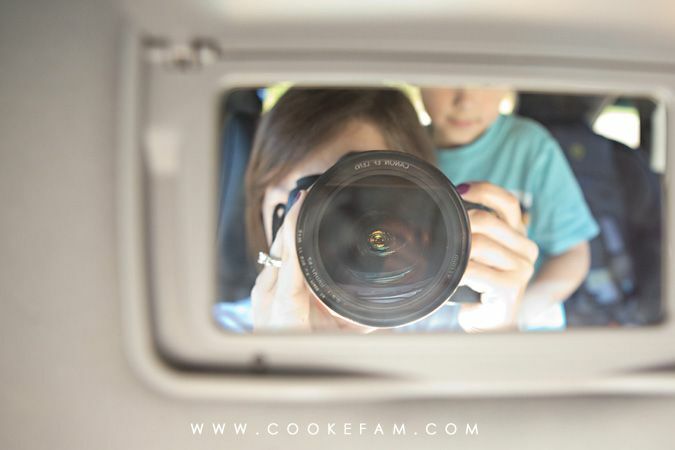 Want to know what we sometimes do for cheap thrills? 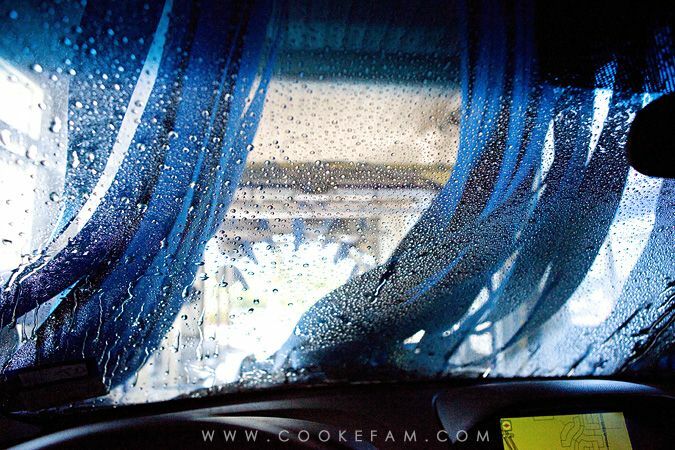 The car wash. For $4 and a few minutes, I can have a clean car and kids that practically crown me queen for the day when we do it because it is that exciting for them. See? Mesmerized by the colored foam spraying onto the car. 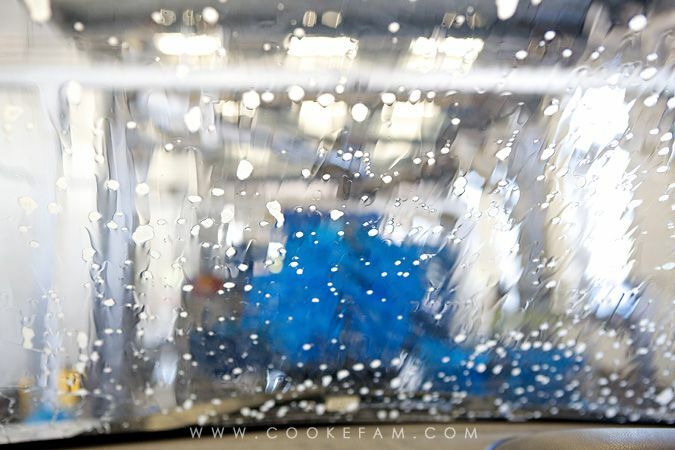 Sometimes we have some fun with the car wash and pretend we're in a boat on the ocean and there's a giant blue octopus attacking us (or some other crazy adventure)...it's amazing what you can come up with during a 3 minute car wash. If Logan gets the chance, he will push every single button in my car. Every single one. He loves to sit on my lap and pretend to drive the car. It kind of makes his day when I let him do it. Sometimes we open the moon roof and check out the sky. You know, for those times that the confined space of the car and the out of control screaming is about to make you want to toss yourself out. Distraction sometimes does the trick. Sometimes. 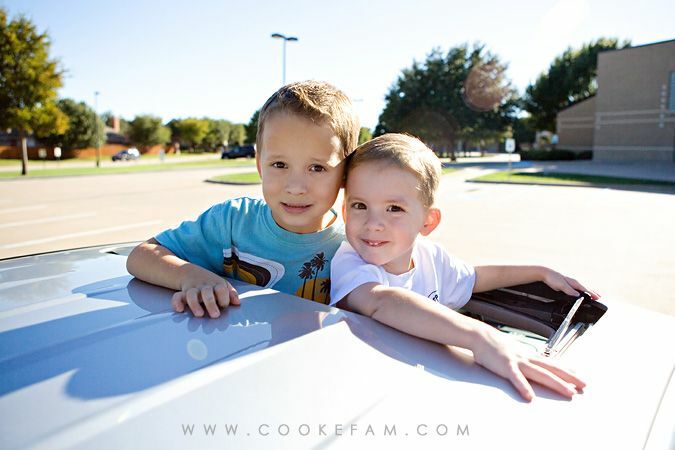 But, when the boys are in a good mood, and especially when I get them by themselves in the car, it can be a great place to talk. Some of the best conversations have happened in the car. And some of the sweetest conversations between the two of them too. I've been a silent observer when they say "I'm sorry," or "I forgive you," or "I love you" to each other. Those are the carpe kairos moments that keep me going. We listen to a lot of music in the car. We have our favorites, of course, but sometimes I try to sneak in a little of my music. Sometimes I can pull it off and sometimes the attempt is met with strong protest. The best thing is when the boys dance to the music. They get really silly and then they want me to watch them. 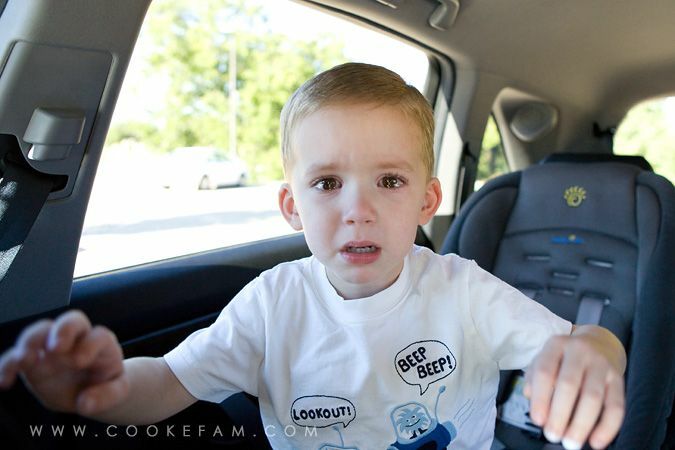 That is another idea that completely escapes them...that mommy can't watch you in the back seat while I am driving. They are very persistent, though. No recap of car experiences would be complete without mentioning the fighting. Oh, the fighting. It makes me crazy. It makes me want to sell my children to gypsies. (I may or may not have actually have threatened that one time.) 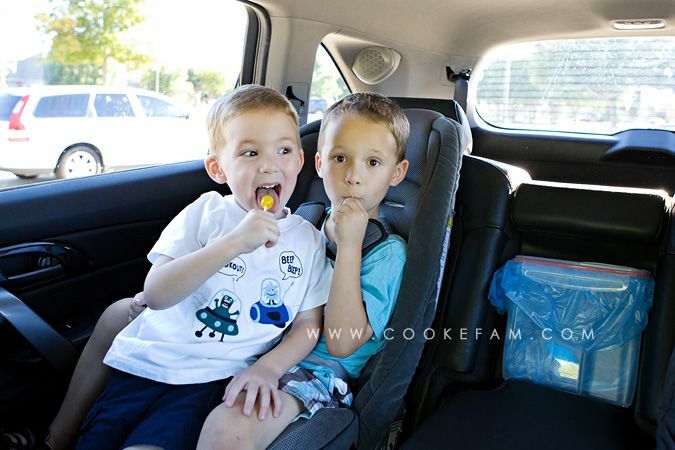 Even though my boys have a seat space in between them in the car, they still manage to fight...even physically, while in the car. But it's the screaming that really gets to me. There are various ways that I choose to deal with fighting depending on the situation (or let's be honest...my level of patience). Or sometimes I just don't deal with it at all. Sometimes I choose to turn up the music in the car really loud and let it become part of the chaos. There are rare times that the boys will actually make up with each other in the car and as mentioned above, it really is one of the sweetest things I get to witness. I think I learned pretty quickly - like even before Logan was born - that I could not leave the house without snacks and a full water bottle. I still do it to this day. It makes my life (and errands) so much easier. And now, I have added to my arsenal a small stash of treats (usually small lollipops) for dire situations. They have saved me more than once. Another thing that works for me is that trash can that sits strategically between their seats. (Thank you, Pinterest.) If snacks keep things running smoothly, then there will inevitably be trash. And as I tell my boys repeatedly, I am not a trash can. So, I made sure they had a place to put their trash while we are in the car. The really funny thing is that they love to put trash in there. 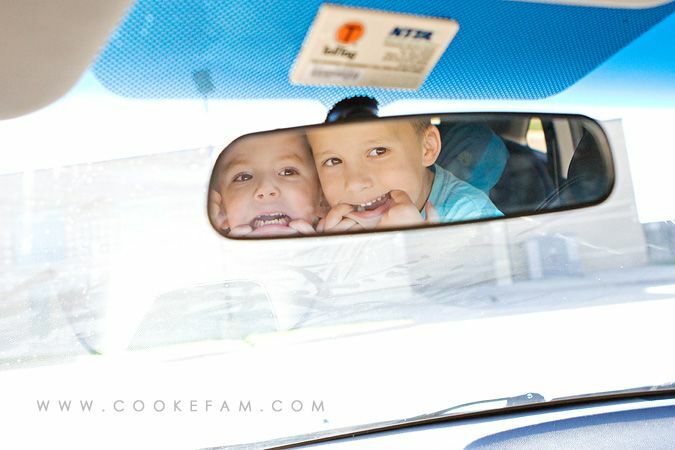 Remembering our times in the car will be a big part of my memories with my boys. I'll remember how it felt like a huge victory when Ethan figured out how to buckle himself completely. And then how to un-buckle himself. Or how Logan can easily ask me 400,000 questions in a 10 minute ride. "Why?" being the most common one. Or how they try to catch the dust particles that become visible in early morning streams of sunlight. Or how they now say, "go, people!" because I may be a little bit of an impatient driver. Or how they love to roll the windows down to "feel the wind." I'm so behind on reading! Definitely love this post. I love that you caught the boys tears in after their fight and the makeup, also. So great!